There was frost on the pumpkins yesterday morning, as the old expression goes. 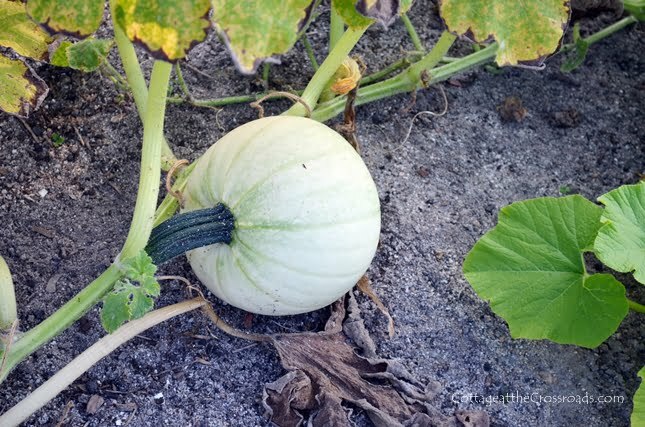 So I thought I’d share some reflections on our first year of growing white pumpkins. 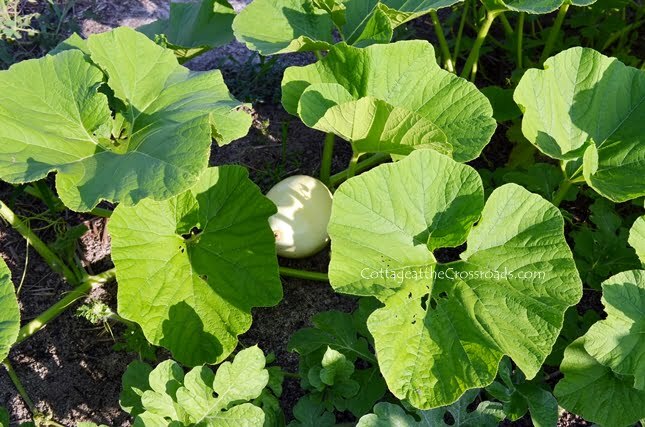 From the time that the seeds that we planted in July germinated and started coming up, I have been fascinated with the pumpkins. I guess that’s because the white variety is still somewhat of a novelty. Or maybe it’s because the vines grow so rapidly that you can see changes from day to day. Leo and I learned a lot about growing pumpkins this year. We did some things right such as preparing the soil before planting. You can read about that in Leo’s post: White Pumpkins for Fall, Anyone? We planted our seeds in mid-July, but next year we will move that date back closer to the first of July because pumpkins need 90 days to mature. We planted 3 different varieties this year: Valenciano (Cinderella shaped) Polar Bear (really large) and Moonshine (long-stemmed). Although I like large pumpkins, I would not plant the Polar Bears again because their skin is smooth with no ridges. Here’s one of the Polar Bears which grew up on our fence, and Leo is cutting it for our granddaughter. We did find out that this type of wire will definitely support the weight of the pumpkins as they are growing. Of the three varieties that we grew, my favorite was the Moonshine because they have really long stems. See the one in this photo? 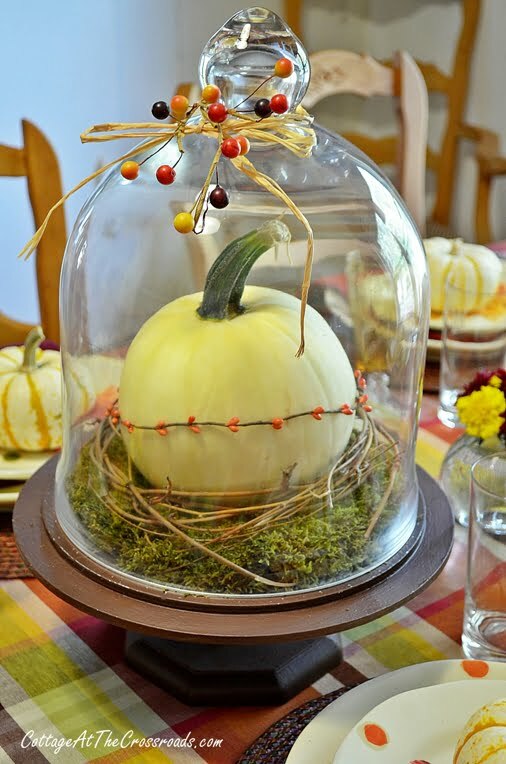 But I also like this Cinderella shaped Valenciano pumpkin that you see in this centerpiece, too! We will definitely grow both of these varieties again. We had a great harvest for our first experience growing white pumpkins. This cart had our first haul out of the garden. One of the things that we discovered was how much water pumpkins need. Wouldn’t you know that as we were growing our pumpkins, we had the driest August and September that we’ve had in a long time! Since we didn’t put a watering system to our pumpkins, I had to hand water those babies just about every day. So next year, we will put a drip irrigation system in when we plant our seeds because it’s so hard to find the root of each vine when the leaves are large. You really don’t want to water anything other than the main stem because too much dampness may lead to powdery mildew. And we will add mulch to the pumpkin patch when the plants are tiny because before you know it, they become so large that you can’t add mulch without stepping on the vines! 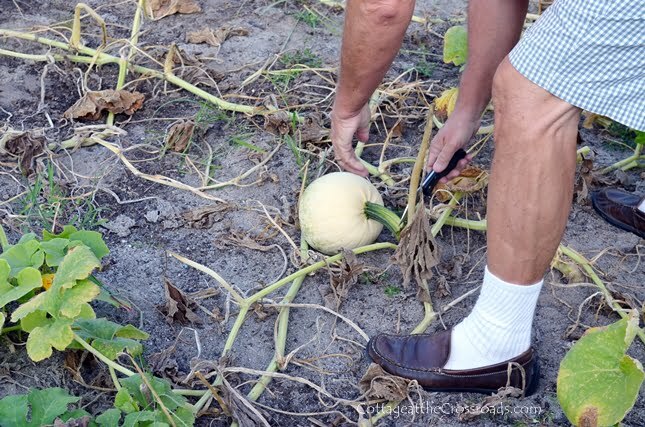 How do you know when to harvest your pumpkins? Well, see how the vines are shriveling up in the photo above? When that starts happening and the stem starts changing color, that’s when you can cut the pumpkins from the vine. But flowers kept forming and baby pumpkins were growing even into October. We had a lot of fun decorating with the first pumpkins that we cut. Here is one of the Polar Bears in a black urn. 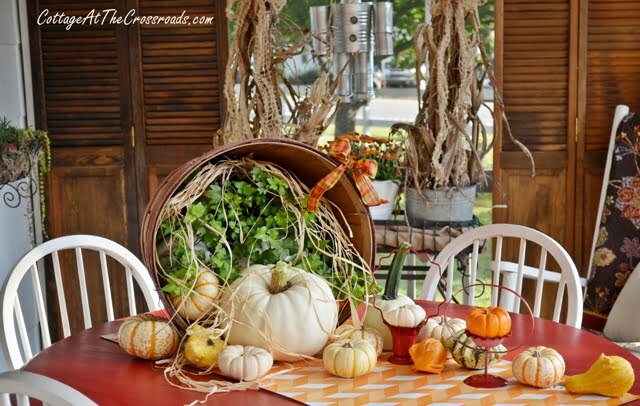 Here I’ve used one of the pumpkins as a centerpiece in our fall tablescape. This one I used to add a little autumnal flavor to our deck. And a few days later, I turned it into a succulent centerpiece. Shortly after, we sent almost all the white pumpkins that we had to be used as decorations for a fall wedding. And then they went to a school where they were going to be painted. It warms my heart to know that so many other people enjoyed them as much as we did. Well, all the vines have been pulled up and this little guy was the last pumpkin to come out of the patch. It was one of the later ones to grow, and you can see that it is still green. I saved the seeds from the pumpkin that I cut to use as a succulent centerpiece. It’s the one with the really long stem, and I happen to have one of the Valencianos on the front porch. I’ll save its seeds, too. Since the Valenciano is an heirloom, its seeds will produce white ones again next year. And because the Moonshine pumpkin is a hybrid, I may get some orange ones from its seeds. That’s ok with me because I love orange ones, too. And I’ve already decided that I’m ordering some seeds to grow some Jarrahdale and Chioggia pumpkins next year along with the peach colored ones (Galeux D’Eysines) with the warty skin! All in all, I would consider our first attempt at growing pumpkins a success. We made a few mistakes, but we’ll try it again while making some adjustments. The season to season challenge of growing a garden is what’s exciting to us. Curious… did your seeds breed true? I have been learning about heirloom seeds and also open-pollination. My understanding is that for true heirloom seed production you need to make sure that anything that can possibly cross-breed is a long distance away. For example. I grow butternut squash every year. This year I also tried to grow (orange) pumpkins for carving. Because it was so dry here this year, some of the pumpkins ripened early and started to rot. I threw them into the compost pile. Not surprising, but some of the seeds started to grow as we had much more rain in August. I got one white pumpkin from one plant (flattened about 9″ around, few ridges), and from the other plant got three yellow pumpkins/squash (flat, yellow-orange, about 9″ around, few ridges). So how did you did you do with your seeds? Eric, we obviously had some cross pollination going on the next year too because our results were similar to yours! 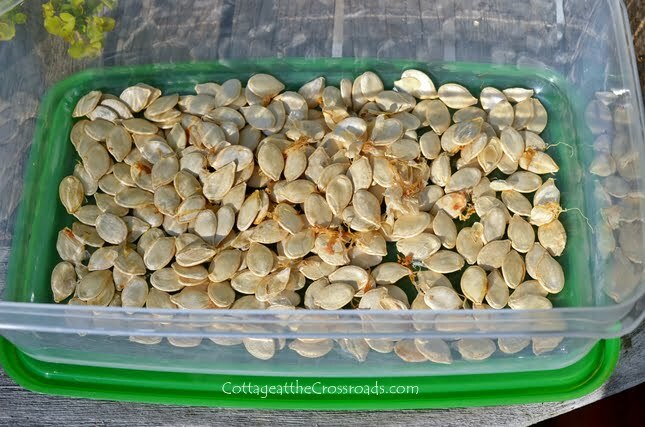 What exactly did the pumpkins grown from your saved seeds look like? The hybrid seeds all reverted back to orange pumpkins the next year. 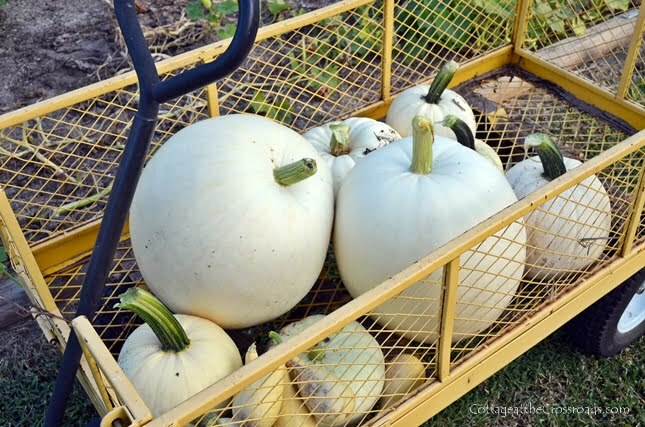 Only the heirloom seeds produced white pumpkins. Thank you for sharing your pumpkin adventures. I learned a thing or two. I’ll have to pin for next year. My first pumpkin patch sprung from discarded pumpkins in a horse manure pile. When I saw the vines, I just started watering! Every pumpkin was a surprise. The Valenianos are great pumpkins for pie. Lots of beautiful orange flesh. 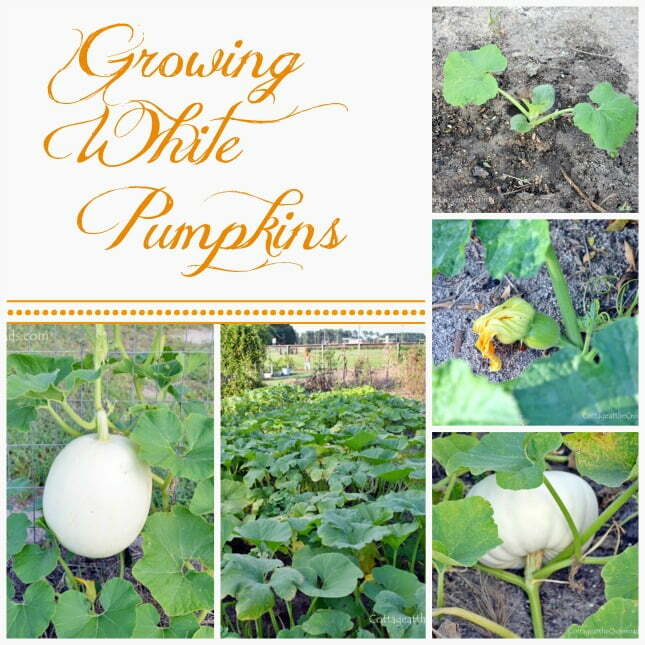 I love these white pumpkins and am so excited to see what you grow next year. You and Leo really do have a special kind of green thumb. I would have loved to see that wedding set up with all your pumpkins. Bet it was beautiful! What a great pumpkin harvest you had! I grew the little baby boo’s this year since pumpkins take up a lot of space which I didn’t have this summer. All your pumpkin vignettes are just gorgeous! Love!! Hi Jane! well, white pumpkins will definitely be in my garden next year. So pretty! 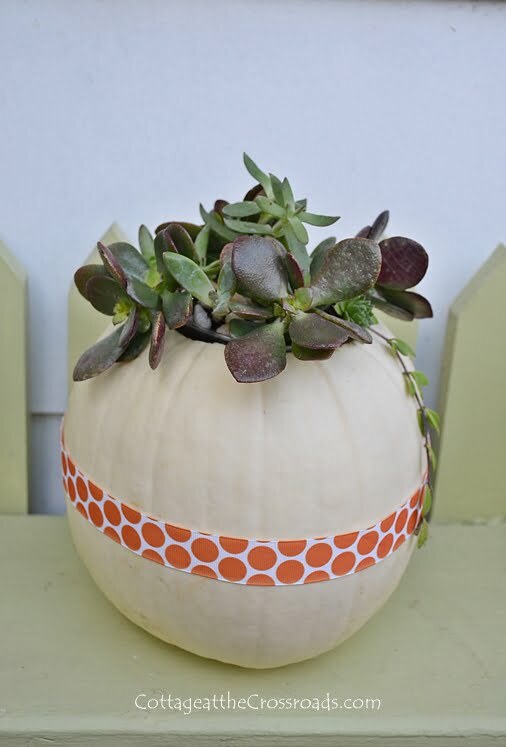 i am so in love with all your white pumpkins + would love to try my hand at these. (they seemed to be hard to find for me this year.) 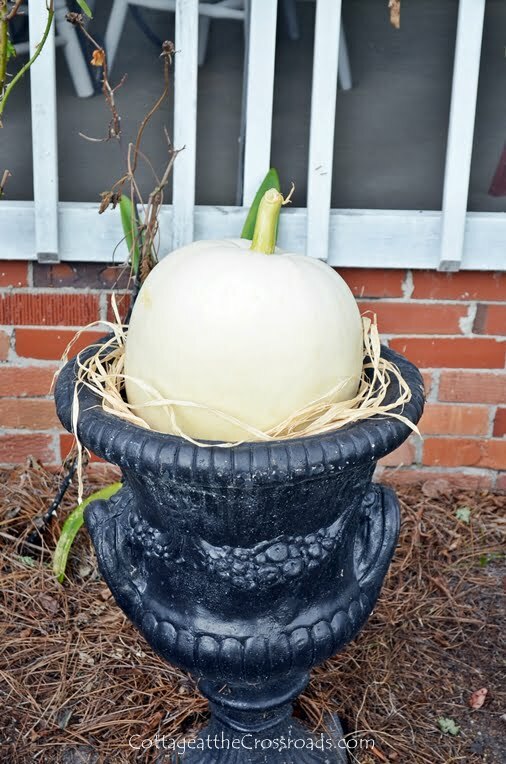 i know we can grow the common pumpkin variety in my zone 7 – georgia. do you know if the white ones will grow well in the humid south? I LOVE your pumpkin patch! I buy Jarrahdale pumpkins every year at a stand in the upstate and they are grown by a NC farmer. I’ll cut one when I’m finished with it and send some seeds to you. Every year I throw the old pumpkin in my compost area by the barn but have only had a few tiny orange pumpkins to volunteer. Maybe one year I’ll get a surprise from the Jarrahdale seeds! WOW!!! I have to give a try and plant white pumpkins next year! Love yours! I have been waiting to see your white pumpkin harvest….you and Leo have such a wonderful first pumpkin harvest…they are beautiful!….the grandkids must have been so excited…I learn so much from your planting and garden advice…did not realize that they needed so much water…Love those pumpkins! 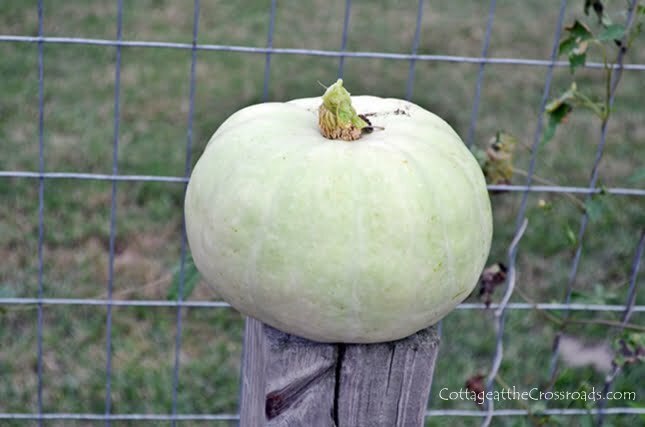 Great post with lots of useful information, it makes me want to try my hand at growing pumpkins. I love how they have been used in so many ways. Thanks for sharing. So gorgeous and I am a bit jealous. We had such a terrible time finding white pumpkins this year. They are some of my favorite variety!!! Sorry I didn’t order the cotton, my girlfriend didn’t want any. In our new home it will be different. I appreciate it so much when people tell us what exact varieties they grew, and whether or not they would grow them again. It helps in my garden every year. I grew Howdens and a non-named orange pumpkin this year, but did not plant early enough. 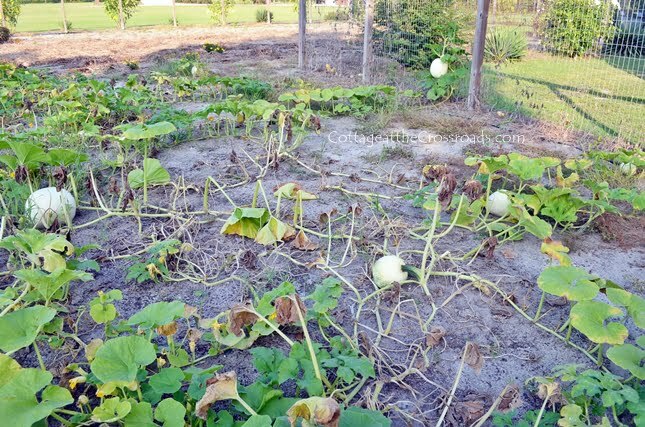 My vines are dead from frost, but several pumpkins were near maturity, and are “oranging” up, but will not make it for Halloween this week. I’ll be giving them to the goats, but starting earlier next year. 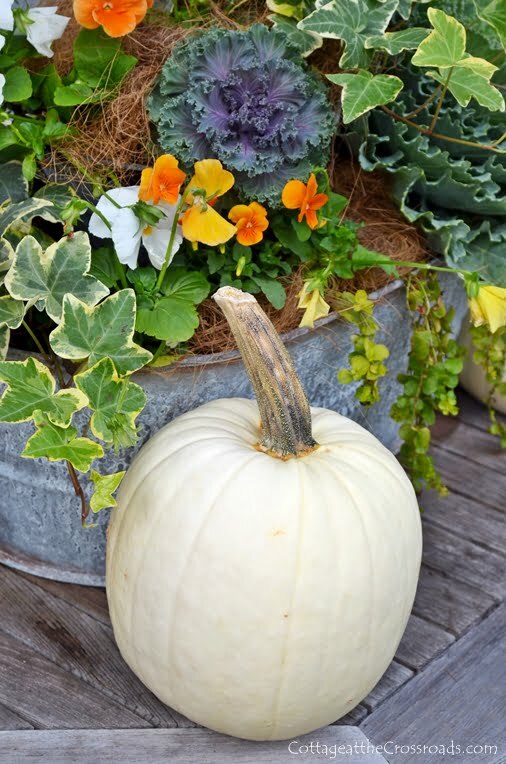 I have a question I live in Tx and can’t find any seeds for white pumpkins and would like to know where I might find them. 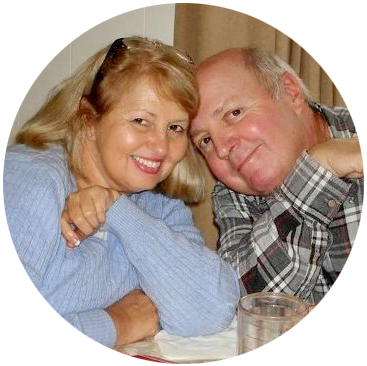 I love your site and all this is truly very nice to read and look at all you have grown. How much work is it to grow pumpkins, I’m not much of a gardener but I would love to try this next year! 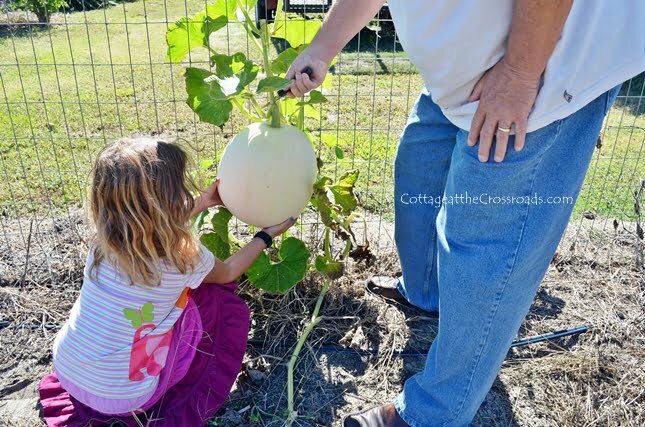 How much fun to have your own pumpkin patch! Thanks for sharing all the info! I forgot…do you have a recommendation for a large pumpkins that has ridges? I love white pumpkins, and you’ve definitely inspired me Jane! I would have to agree with you…your first effort was a success. They’re beautiful, and I love the long stems too. Loved your pumpkin post .. they are all beautiful , love how you used them all ! I am so glad you saved the seeds to roast, that is my favorite part. Your white pumpkins are beautiful and so popular right now.